The analysis of dyes in cultural heritage samples is a well-known challenging task, due to their inherent high tinting strength and consequent low concentration in the carrying matrix a fact that severely limits the number of analytical techniques that can be efficiently and micro-destructively employed for their detection and unambiguous identification. In the present study, an advanced and alternative SEIRA based analytical protocol for the analysis of small quantities of synthetic colorants has been proposed. 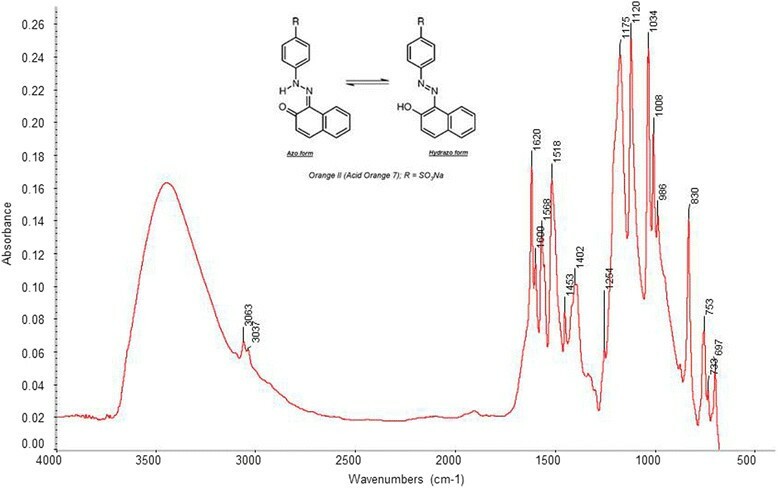 The method has been set up for the identification of Acid Orange 7 (AO7) using Au nanoparticles obtained by laser ablation in solution (LASiS). Analyses have been performed applying a drop containing a mixture between the colorant and the Au colloidal solution in its unaggregated state on a gold coated glass slide for RAS (Reflection Absorption Spectroscopy) analysis. The first results showed that, thanks to the enhancement produced by the nanoparticles, it is possible to analyze small amount of diluted solutions containing the colorant. Thus, the method has been successfully applied for the analysis of few pieces of dyed wool, after the development of a suitable micro extraction procedure. In 1980 Harstein et al. discovered that when a molecule was absorbed on metal surfaces, its infrared absorptions appeared more intense than what would be expected for traditional measurements. This effect was named Surface–Enhanced Infrared Absorption (SEIRA), to recall the analogy with SERS (Surface Enhanced Raman Spectroscopy), which was already known since the beginning of 70th ,. Many papers have been published trying to explain the enhancement mechanism which may be related to the result of the enhanced optical field at the surface of metal nano-particles when illuminated at the phonon resonance frequencies. In analogy with the interpretation of the SERS effect, Osawa  suggested that the total enhancement is produced by the combination of electromagnetic and chemical mechanisms. Moreover, it was noticed that the enhancement was significant for the first monolayer directly attached to the metal surface and decayed sharply within 5 nm from the surface. In addition, vibrational modes that have dipole moment derivative components perpendicular to the surface were preferentially enhanced . Enhanced infrared spectra can be obtained in transmission, ATR (attenuated total reflection), external reflection and diffuse reflection mode  and mainly depend on the morphology of the metal surface. In particular, the enhancement depends on the size, the shape and particle density of the metal island films. The SEIRA-active metal films can be commonly produced by vacuum or electrochemical deposition. Depending on the type of support, different configurations such as sample-metal, metal-sample and metal-sample-metal have been successfully adopted. Metal colloids have become the most commonly used substrates, both in SERS and in SEIRA, thanks to their easy preparation and the possibility of inducing aggregation, during and post–synthesis ,. In more detail, metal colloidal nanoparticles may be produced using the chemical (reactions in solution), the physical (laser ablation) or the photophysical (photoreduction of Au and Ag salts) methods. In 1979 the first report describing the use of metal colloids for SERS analysis was published  proposing Ag and Au solutions obtained by reduction of AgNO3 and K(AuCl4) with NaBH4. Only a year later, in 1980, Kerkel et al. reported the use of citrate ions as reducing agent. According to the literature, silver colloids seem to produce the largest enhancement effect among metal colloids, although their oxidation represents an intrinsic limitation. In particular the citrate – reducing method, proposed by Lee and Meisel , has been widely used for SERS analyses. However, the synthesis generates by-products that could be enhanced in surface-vibrational spectroscopies, as spurious peaks, interfering with the detection of the analytes. Recently, the hydroxylamine hydrochloride reducing method  has been considered the most effective system for the production of colloidal solutions to be employed for spectroscopic applications  because most of the reaction byproducts are gaseous and leave the system. Laser ablation synthesis in solution (LASiS) is the methodology which allows to synthesize nanoparticles without interfering molecules. From the pioneering work of Fojtik and Henglein , the methodology has been improved as reported in a recent review . With LASiS, stable colloidal solutions can be obtained in pure water and other solvents without the presence of any stabilizing agents due to the charges produced on the nanoparticles by the ablation. Moreover, the nanoparticles, presenting a clean surface, can be easily reached by molecules, assuring a good interaction, which is mandatory for observing an enhanced signal. This type of nanoparticles shows, therefore, an advantage over those obtained by chemical reduction of salts in solution, in particular for the absence of interfering species in the colloidal solution. For SEIRA analysis the sample can be placed on the active substrates using different methods. Using the “drop-drying method” a dilute solution of the analyte is applied on the support and analysed after drying. Another possibility is to form a thin film of the sample on the metal surface by evaporation under vacuum. SEIRA analyses can be performed also on Langmuir films obtained by horizontal deposition in a Langmuir balance which are then transferred to the SEIRA substrate . Since the enhancement factors (about 10–1000 times) of SEIRA is not competitive when compared with those of SERS, few attention has been dedicated to possible applications of this method. However the cross sections for absorption in the infrared range are order of magnitude higher than the corresponding Raman cross sections. Thus, even if SEIRA enhancement is modest, it can have effect in practical applications concluding that both techniques are under development as promising “optical sensor technologies” . Nevertheless, few analytical applications of SEIRA have been reported up to now since the main concern is related to the poor reproducibility of the substrates . However, SEIRA has been used in the analysis of environmentally hazardous chemicals in waste waters , as a detector coupled to chromatographic techniques, such as liquid and gas chromatography  or to immunological techniques ,. In the biochemical field the application of this technique was considered particularly useful to obtain information on the structural changes at a molecular level . Moreover, one field in which SEIRA has been widely employed is the study of the molecular organization of thin films formed with different preparation methods -. SEIRA has been also successfully proposed to study the catalytic behavior of metal particles . Several papers have been published concerning the combination of SEIRA with electrochemical methods, employing the metal islands as electrodes . In particular, the ATR Kretschmann configuration in which the metal islands are deposited directly on the crystal is a successful tool for electrochemical dynamic studies. In this study, we have proposed an advanced and alternative SEIRA based analytical protocol for the analysis of small quantities of colorants. Indeed the analysis of dyes in cultural heritage samples is a well-known challenging task, due to their inherent high tinting strength and consequent low concentration in the carrying matrix a fact that severely limits the number of analytical techniques that can be efficiently and micro-destructively employed for their detection and unambiguous identification. In more detail, Acid Orange 7, a synthetic dye used for textile dyeing, has been selected in order to develop an analytical protocol using gold nanoparticles obtained by LASiS. The colloidal solutions, characterized with UV–vis spectroscopy, have been applied on a gold coated glass slide employing two different modalities. The most promising protocol has been employed for the detection of the same colorant extracted from dyed wool samples. To this aim, a micro-extraction procedure has been selected by comparing different previously published extraction approaches ,. The selected dye, Acid Orange 7 (AO7), and the dyed wool were kindly provided by RCE (Rijksdienst voor het Cultureel Erfgoed/Cultural Heritage Agency of the Netherlands) in the frame of the European project CHARISMA. The synthesis of gold nanoparticles (AuNPs) was obtained by LASiS according to previous reports ,. Briefly, a bulk metal target was immersed in NaCl 10−5 M water solution and irradiated with 9 ns pulses of a Nd:YAG laser (Quantel YG-981E-10) at 1064 nm using a fluence of 10 Jcm−2. The colloidal concentration was monitored with UV–vis extinction spectroscopy . In this way a dispersion of nanoparticles with diameters between 18 and 20 nm was obtained. The colloidal solution was used as obtained or after a controlled aggregation, with centrifugation at 30000 RCF for 10 minutes of the AuNPs. In this way an active substrate, made up of aggregates of 100–150 nm, was obtained without introducing other interfering material. The aggregated AuNPs were then dispersed in pure water by sonication. 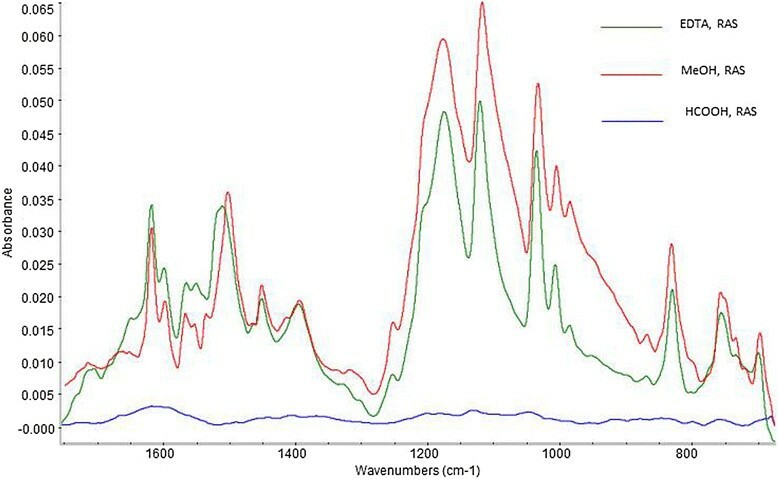 UV–vis spectra of colloidal suspensions were recorded between 200 and 800 nm, using a Varian Cary Bio UV – Vis Spectrophotometer (Varian, Palo Alto, CA, US), single beam. The reference was taken on a quartz cell filled with tridistilled water. Measurements were performed using a 1 cm quartz cell. The FTIR measurements were performed on gold coated glass slides for RAS (Reflection Absorption Spectroscopy) analysis, using a Thermo Nicolet iN™ 10MX raster scanning microscope, fitted with an MCT detector cooled by liquid nitrogen. Spectra were recorded in the range 4000–675 cm−1 with an aperture 50 × 50 μm, spectral resolution 4 cm−1 and 128 or 512 number of scans. Data collection and post-run processing were carried out using the OMNIC Picta™ software (Thermo). Gold coated glass slides were ultrasonicated in ethanol and dried under ambient conditions before the application of the analyte. Two protocols were set up, as summarized in Table 1. The first envisaged the deposition of 5 μl aliquots of aggregated or unaggregated colloidal solutions over a gold glass slide obtaining a circle of about 2 mm diameter. Subsequent depositions of 5 μl of aggregated or unaggregated colloidal solutions were over applied for 3, 5 or 8 times, in order to produce a more homogeneous distribution. The obtained substrates were characterized by RAS spectroscopy after drying to define the presence of polluting species. 1 μL of 10−4 M AO7 solution was deposited both on the naked gold coated slide and over the different types of colloidal depositions, in order to compare the spectra and to verify the presence of surface enhancement effects. SEIRA spectra were registered on the external profile of the drop of the colorant applied over the colloidal deposition, on points in which the borders of the colorant were not superimposed to the one of the colloid (see Figure 1). SEIRA analyses performed applying 1 μL of 10 −4 M AO7 solution over the unaggregated AuNPs spot obtained after 8 depositions. a) Photo of the colorant spot, numbers refer to points of analysis b) SEIRA spectrum registered in position 4 (blue profile), RAS spectrum registered on the border of a drop obtained spotting 1 μL AO7 10−4 M solution (green profile) and RAS spectrum registered on the border of a drop obtained spotting 1 μL of the unaggregated AuNPs solution (red profile), common scale c) SEIRA spectrum registered in position 4 (blue profile) and RAS spectrum registered on the border of a drop obtained spotting 1 μL AO7 10−3 M solution (red profile), full scale. In the second protocol, the interaction of the colorant with the nanoparticles (aggregated and unaggregated) was obtained in solution. In this case, 10 μl of 10−4 M AO7 solution were dried and 10 μl of aggregated or unaggregated gold colloid solutions were added. After sonication, 1 μl of the obtained solutions was spotted on the gold coated glass slide. 1 μl of 10−3 M AO7 solution was deposited on the gold coated slide in the absence of AuNps and used as reference for peak attribution. 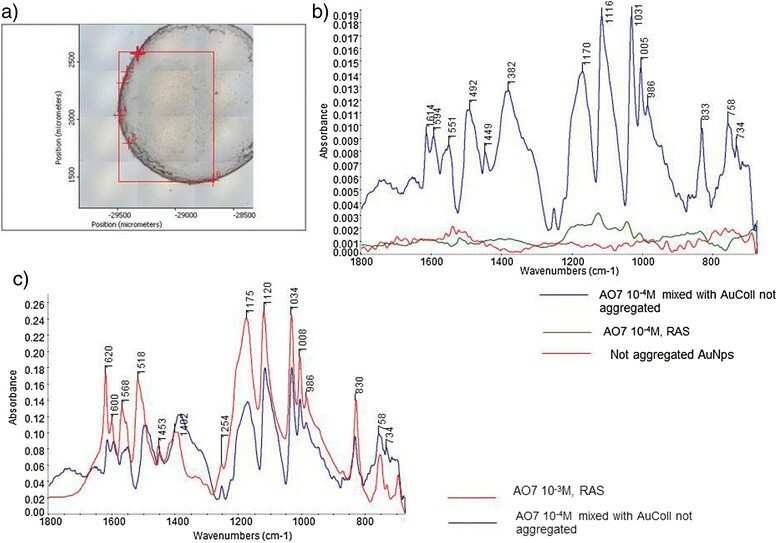 Extractions were performed employing mild methods in order to avoid hydrolysis of the wool and thus the presence of spurious bands due to the presence of by-products, in the FTIR spectra. Preliminary tests were performed with 1 mg of dyed wool (corresponding to 6 mm of a woolen yarn). Then, the amount of wool was reduced to just a few pieces of fiber (less than 0.01 mg, which were not possible to be weighted corresponding to few mm in length of a single fiber), using a reduced amount of solvents. Formic acid method: 1 mg of the dyed wool was added with 40 μl of a mixture 85:15 (v/v) methanol-formic acid for 60 minutes at 50°C . After removing the wool, the extract was evaporated to dryness under ambient conditions for a night and then reconstituted in a small amount (10 μl) of demineralized water. Ethylenediaminetetraacetic acid (EDTA) method: 1 mg of the dyed wool was added with 40 μl of a mixture 2: 10: 88 (v/v/v) 0,001 M aqueous H2EDTA/acetonitrile/methanol for 30 minutes at 60°C . After removing the wool, the extract was evaporated to dryness under ambient conditions for a night and then reconstituted in a small amount (10 μl) of demineralized water. Methanol (MeOH) method: 1 mg of the dyed wool was added with 40 μl of methanol for 30 minutes at 60°C After removing the wool, the extract was evaporated to dryness under ambient conditions for a night and then reconstituted in a small amount (10 μl) of demineralized water. For comparison, a small amount (1 μl) of each reconstituted solution was deposited on a gold coated slide for RAS measurements. The developed SEIRA protocol was applied for the analyses of few pieces of fiber extracted with the MeOH method. The fiber was extracted employing 3 aliquot of 10 uL of MeOH over a time of 30 min at 60°C. Every 10 minutes, approximately, the solvent dried and a new aliquot of MeOH was added. The extract was reconstituted with 5 uL of water and 5 uL of the unaggregated colloidal solution. After sonication, 1 μL was spotted on a gold coated glass slide and analyzed in RAS mode. In order to obtain a reference spectra, 1 μL of the 10−3 M AO7 solution was spotted on a gold coated glass slide and RAS measurements were performed on the external profile of the drop (Figure 2, band assignment is reported in Table 2 -). RAS spectrum registered on the border of a drop obtained spotting 1 μL AO7 10 −3 M solution. The UV–vis-NIR spectra recorded for unaggregated and aggregated AuNPs are reported in Figure 3. The localized surface plasmon resonance (LSPR) of unaggregated AuNPs is useful for its characterization using the Mie-Gans model . 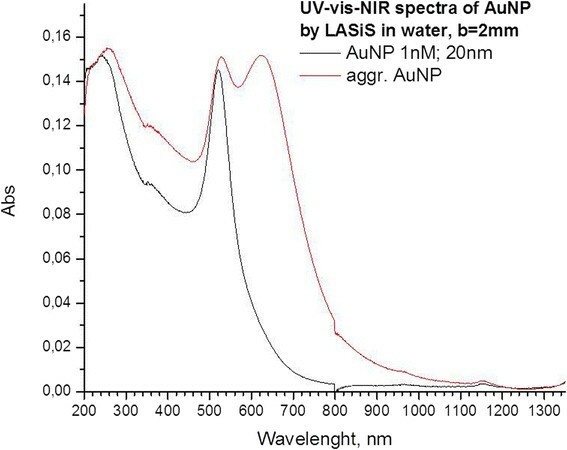 By fitting this spectrum one estimates that the average dimension of the AuNPs is 20 nm and their concentration 10−9 M. The aggregated AuNPs present a characteristic red- shifted plasmon resonance band, according to the Mie-Gans model used for size and concentration evaluation of gold colloidal solution . Aggregates composed by few tens of nanoparticles, 10–20 AuNPs, cause a typical band at 600-800 nm, as just reported before ,. UV – Vis spectra of the AuNPs unaggregated (black line) and aggregated (red line). 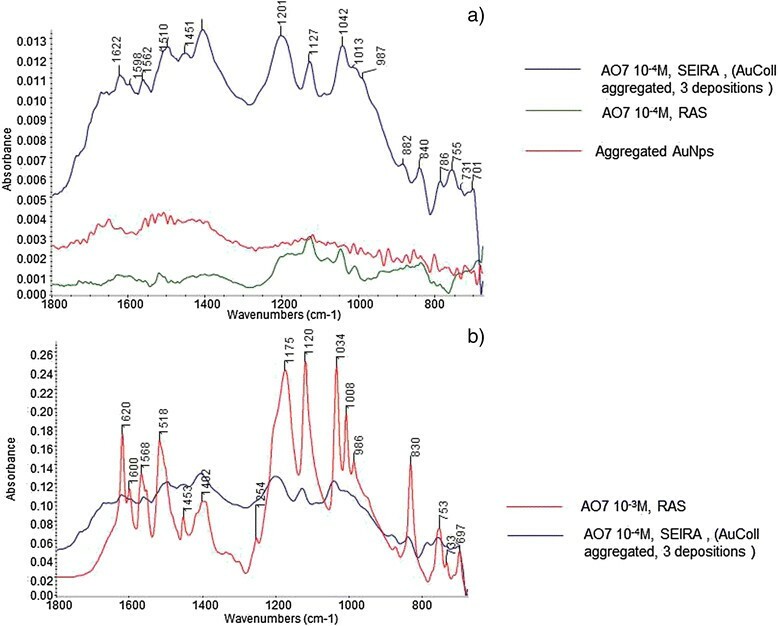 RAS analyses of the two colloidal solutions showed the presence of bands with very low intensity probably due to some residual environmental pollutants, which, however, didn’t affect the SEIRA spectra (Figure 4). RAS spectra registered on the border of a drop obtained spotting 1 μL of a) unaggregated AuNPs b) aggregated AuNPs. Multiple depositions of the colloidal solutions, as recalled in the experimental part, were applied on a RAS gold coated glass slide. A drop of colorant was then deposited over the AuNPs and the spectra were recorded on the border of the colorant drop, in correspondence of the inner part of the colloid substrate (Figure 1a). 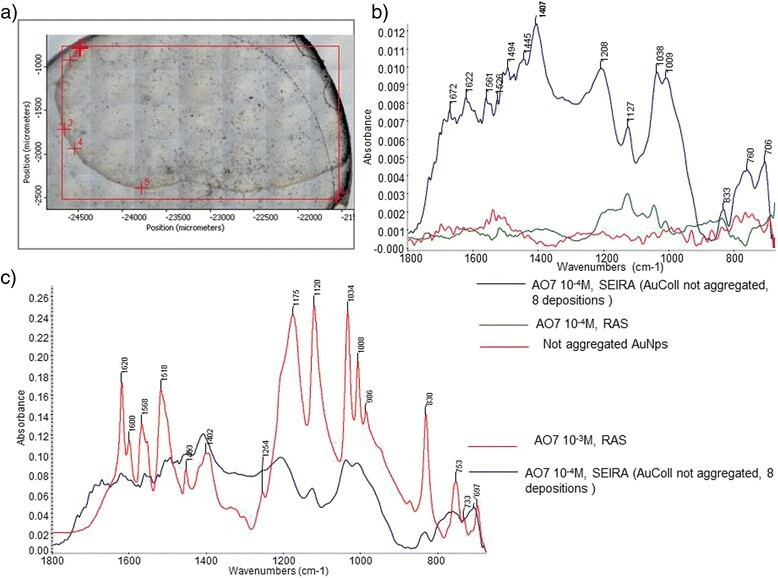 Spectra of AO7 deposited on the unaggregated AuNPs drops showed an enhancement of the signal in few points, probably depending on the local formation of aggregates. It was observed that increasing the number of colloid drops depositions an increase of the signal is observed just in few areas, probably due to the formation of aggregates with a more efficient geometry. In Figure 1b one of the enhanced spectra is compared with the RAS spectrum obtained applying the same volume of AO7 10−4 M solution directly on a gold coated glass slide. It can be noted that without the nanoparticles the signals of the colorant can be hardly distinguished from the background. In the presence of the AuNPs an increasing in signal intensity was detected (Figure 1b) and the main features of the colorant can be distinguished from the background. However spectra were characterized by a high variability of the intensity and by a worsening in the definition of the absorption bands as it can be evinced comparing the spectrum reported in Figure 1 with a reference spectrum of a more concentrated solution of AO7 (10−3 M) acquired in RAS (Figure 1c). The enlargement of the bands and the shift in some maximum positions may be ascribable either to scattering events or to the presence of some pollutants derived either by the colloid or by the water employed to prepare the dye solution. On the other hand, spectra registered on the colorant deposited on the aggregated AuNPs showed an enhancement for all the three types of multiple depositions (mainly on the three depositions), even if they were characterized by a variable intensity, depending on an inhomogeneous distribution of the colloidal aggregates. As an example, a spectrum of medium enhancement from the ones obtained on the three depositions is reported in Figure 5 and compared with the reference RAS spectrum of the AO7 10−4 M solution applied directly on a gold coated glass slide and with the RAS spectrum registered on the AuNPs. Also in this case, in all the enhanced spectra an enlargement of peaks can be noted and the definition of the bands was worse than in the spectra registered on a more concentrated solution without AuNps (Figure 5c). Nevertheless, the identification of the colorant absorption bands was not compromised. 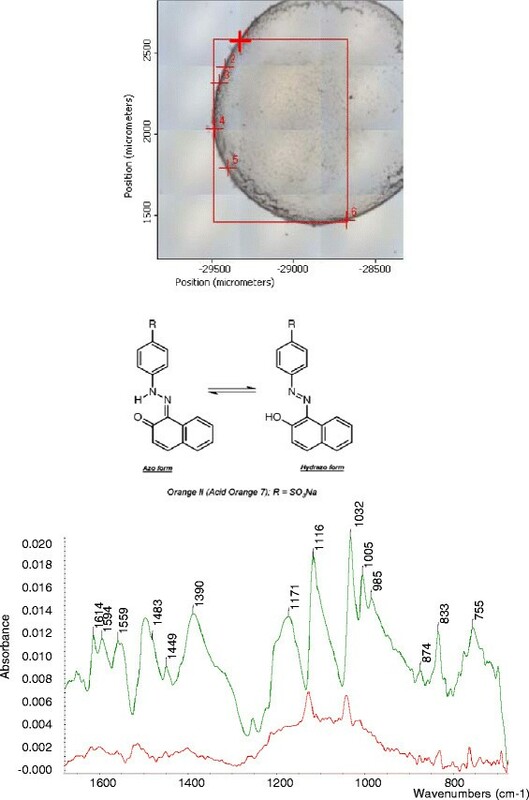 SEIRA analyses performed applying 1 μL of 10 −4 M AO7 solution over the aggregated AuNPs spot obtained after 3 depositions. a) SEIRA spectrum registered on the border of the drop (blue profile), RAS spectrum registered on the border of a drop obtained spotting 1 μL AO7 10−4 M solution (green profile) and RAS spectrum registered on the border of a drop obtained spotting 1 μL of the aggregated AuNPs solution (red profile), common scale b) SEIRA spectrum registered on the border of the drop (blue profile) and RAS spectrum registered on the border of a drop obtained spotting 1 μL AO7 10−3 M solution (red profile), full scale. The second evaluated protocol was based on the preparation of a mixture between the colloidal solutions and the colorant which is subsequently applied on the RAS support. FTIR analyses were performed on the external profile of the drop, which was characterized by a higher concentration of the mixture components (Figure 6a). SEIRA analyses performed after spotting 1 μL of the AO7 10 −4 M solution containing the unaggregated AuNPs. a) Photo of the drop, numbers refer to points of analysis b) SEIRA spectrum registered in position 3 (blue profile), RAS spectrum registered on the border of a drop obtained spotting 1 μL AO7 10−4 M solution (green profile) and RAS spectrum registered on the border of a drop obtained spotting 1 μL of the unaggregated AuNPs solution (red profile), common scale c) SEIRA spectrum registered in position 3 (blue profile) and RAS spectrum registered on the border of a drop obtained spotting 1 μL AO7 10−3 M solution (red profile), full scale. Figure 6b shows one of the spectra registered for the 10−4 M solution of AO7 mixed with the unaggregated AuNPs. It can be noticed that a remarkable enhancement of the signal is obtained without compromising the resolution of the absorption bands present in the spectra. Indeed comparing the obtained FTIR spectrum with the RAS spectrum on a 10−3 M AO7 solution a better correspondence of the band can be observed (Figure 6c). Conversely, band resolution of spectra registered on the 10−4 M solution of AO7 mixed with the aggregated AuNPs was worse than that obtained with the previous method, even if a significant enhancement was obtained. Therefore, the unaggregate colloid-colorant mixture procedure was selected as the most efficient approach for an easier identification of the colorant. To verify the performances of the method, 5*10−5 M and 10−5 M solutions were also analyzed. Spectra registered on the drops obtained with the 5*10−5 M solution showed characteristic bands of the colorant (Figure 7), which were not detected in the reference spectrum obtained in RAS mode on the dye solution at the same concentration. 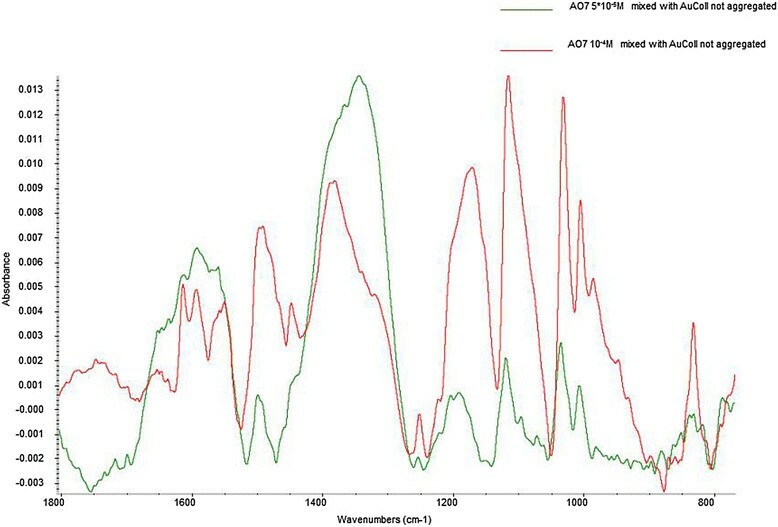 However, for the 10−5 M solution, any diagnostic AO7 absorption bands were identified, even with the addition of the AuNP, due to the high noise of the spectra. SEIRA spectrum registered on the border of the drop obtained spotting 1 μL AO7 5*10 −5 M solution containing the unaggregated AuNPs (green profile) and SEIRA spectrum registered on the border of the drop obtained spotting 1 μL AO7 10 −4 M was mixed with the unaggregated AuNPs solution (red profile), full scale. Different extraction procedures were tested as mentioned in par 2.5. Preliminary investigations were carried out on a measurable amount of dyed wool (1 mg), then the most promising procedure was employed on just a few pieces of fiber (less than 0.01 mg, which were not possible to be weighted). Comparing the three procedures (Figure 8) the HCOOH method appeared to be the less effective in extracting Acid Orange 7. Comparison between the extraction methods. RAS spectra registered on the border of the drop obtained spotting 1 μL of the solution extracted from wool (1 mg, 6 mm in length of a woolen yard ) with the: EDTA (green profile), MeOH (red profile), HCOOH (blue profile) methods, common scale. The EDTA method showed an optimal extraction capability. Intense and well resolved spectra were obtained without the presence of spurious peaks. However, reducing the amount of wool, spurious peaks connected to EDTA appeared in the spectrum (data not shown). The methanol (MeOH) method provided results similar than EDTA with the advantage to be completely eliminated when the sample was dried and, therefore, it was selected for SEIRA analyses. The MeOH extraction method was employed for the extraction of a few pieces of fiber. Then, as described in par.2.4, the extract was mixed with unaggregated AuNPs and analysed in RAS mode. The obtained SEIRA spectra were characterized by a weak intensity of the signal (Figure 9) and even if bands resulted enlarged by the presence of other contaminants, diagnostic absorption bands, related to the presence of AO7, resulted identifiable as peaks or shoulders, allowing the identification of the colorant used in the dyeing process. SEIRA spectrum registered on the border of the drop obtained spotting 1 μL of the solution extracted with the MeOH method from few fibers (few mm of a single fiber) dyed with AO7 and mixed with the unaggregated AuNPs (green profile) and RAS spectrum registered on the border of the drop obtained spotting 1 μL of AO7 10 −3 M solution (red profile), full scale. This paper shows that SEIRA can be used as an analytical method to analyze small quantities of colorants. The method has been set up using naked AuNPs produced by means of laser ablation, allowing strong enhancements of the signals, without the presence of spurious by-products which may affect the results. The best results in term of enhancement and spectral resolution were obtained mixing the colorant solution with the unaggregated particles. The analyses were then performed on a drop deposited on a gold coated glass slide after drying in RAS mode on the borders of the spot, which contain the highest quantity of colloid and colorant. This method allowed to analyze solution down to 5*10−5 M and has been applied for the analyses of extracted dyed wool samples after the setting up of a suitable micro extraction method aimed at avoiding hydrolysis of wool and the presence of by-products which can hinder the colorant absorption bands. The extraction with MeOH, which provided the most effective results among three extraction methods tested, was applied for the analysis of a few pieces of fiber. SEIRA spectra obtained mixing the extract with the unaggregated AuNPs allowed to recognize bands of the colorant, even if present in low concentration. Further efforts will be devoted to optimize the micro extraction procedure in order to improve the detection limit. Moreover the method will be applied for the analyses of several types of colorants in order to understand the limits of the proposed methodology in the discrimination among different compounds. The micro-extraction SEIRA analyses of small amount of colorants may find several applications for the study of artistic samples as well as those coming from the forensic and the environmental fields. All the authors contributed in planning the research activities. SP and MQ proposed this study. SP and RM coordinated the scientific part. SP drafted the manuscript. MQ, GS, IB performed the data acquisition. SP, MQ, GS, IB performed the data analysis. SP performed the data interpretation. LL synthesised and characterised the gold nanoparticles under the supervision of MM. Both the two authors revised the manuscripts and wrote the parts on the synthesis and characterisation of the gold nanoparticles. SP and RM revised and finalised the final manuscript and coordinated the projects which have funded this research. All authors read and approved the final manuscript.